Precision blade-guide with hard metal pads, bearings and anti-corrosion treatment. 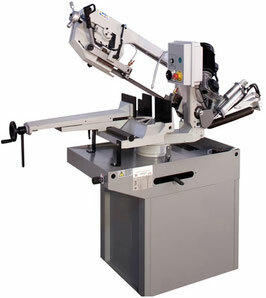 Cutting cycle manual: vice locking of material to cut - the sawband runs as long as the operator holds the gripswitch - manual pull down of the sawframe. Side-to-side mobile vice with quick approach lever. Designed to avoid rust seizure and chips jamming. Mechanical blade tension with handwheel. Precision blade-guide with hard metal pads and roller bearings. Anti-corrosion treatement with electrolytic nickel-plating and galvanization zinc plating ensure long lasting cutting precision. Electric installation according CEE. Set of fuses against current overload. Coolant liquid with electropump and crucible. Severe tests on mechanical tolerances, electric installation and final performance test. D.A. Automatic Downfeed: Automatic pull down with sawframe gravity down-feed controlled by hydraulic cylinder with adjustable speed.